Environmental Mete, Pocket-Sized Weather Meter - Gilson Co. The MA-317 Kestrel® 5200 Professional Environmental Meter is a handy, multi-function unit that takes the guess-work out of monitoring plastic shrinkage cracking in fresh concrete. This portable model meets ACI 308R guidelines for documentation of concrete placement and curing conditions. It offers a complete suite of environmental measurements including air temperature, wind speed, relative humidity and barometric pressure. It also computes evaporation rate, dew point, heat stress and wind chill. Input temperature of the concrete from a separate thermometer (not included) and gain access to evaporation rate. The hi-res graphic display is backlit, making it easy to read in bright or low-light conditions. Up to 2,900 data points can be uploaded and stored to a PC. 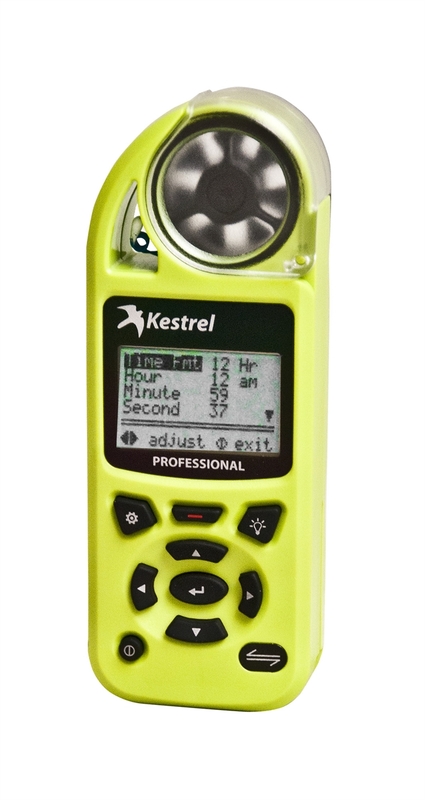 MA-317B model features Kestrel’s Bluetooth® LINK connectivity to transmit live measurements to a smartphone or tablet when in range, and must be used with the MA-167 Kestrel Link Dongle, purchased separately. A water proof carrying pouch, wrist lanyard and AA Lithium battery are included with the Meter. Optional Mini-Tripod and Wind Vane mounts position the meter properly for optimum performance.